How Much Does Gutter Cover Installation Cost? Gutter maintenance is a regular, unavoidable part of home ownership, but opting for gutter cover installation can reduce the frequency of gutter cleaning work and gutter maintenance. Gutter cleaning costs can range between $100 and $300 per session and usually required at least twice a year. What gutter covers do is reduce the quantity of medium and large-size debris that can make its way into your gutters. Mesh: A fine mesh made from metal sheets full of tiny holes. This gutter cover attaches to the roof's shingles in order to cover the gutter. Reverse: This type of gutter cover directs the water flow at a downward angle while forcing leaf debris to fall to the ground. Bottle Brush: Consists of multiple bristles which face upward from the inside of the gutter. Catches the leaves on top while the water flows through. Foam: Manufactured from plastic, these covers fit inside the gutter, blocking plant and leaf debris from entering the gutter stream. 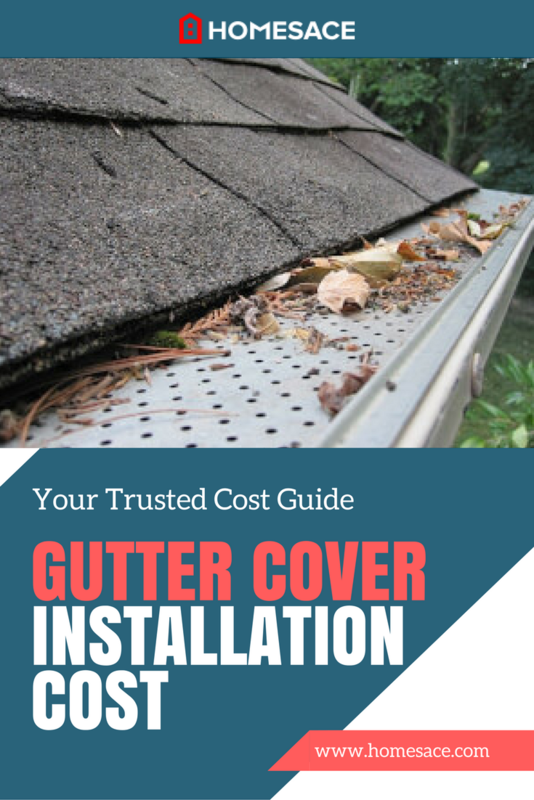 How Much Will It Cost To Install Gutter Covers? Every home is different so the cost to install gutter covers can vary quite a bit depending on various factors. The average home has a gutter length of about 200 linear ft. Therefore, this average will be used to calculate the costs for this particular guide. Most American homeowners can expect to pay as little as $200, but in some cases up to as much as $3,600. On a national average, however, a gutter cover installation job is around $2,000. Fortunately, there are a number of options to choose from. Getting in touch with a local professional for a free gutter cover installation estimate will help you nail down a more accurate price tailored to your home's needs. Gutter cover installation requires certain materials. The cost of these materials will be influenced by the types of gutter covers chosen and the length of the sections required. On average, expect to spend between $2 and $20 per linear ft. Newer designs are more efficient and work a lot better than the older ones. The national average for gutter cover materials can range from as little as $100 and up to as much as $2,600. There are also gutter cover companies which specialize in their own custom designs. These companies can charge a premium price for custom built gutter covers. Averaging around $6 to $8 per linear ft., some of these companies have also been known to charge exorbitant fees for custom work, so be sure to compare several estimates before you buy. Consider the following gutter cover materials and costs per linear ft. versus an average price for 200 linear ft.
Professional installation can be completed fairly quick. Gutter cover installation could take roughly 5 to 7 hours, averaging $260, or around $43 an hour for labor. Tasks include preparing the layout, fabrication of gutter covers for fitment before finally securing them down. With such variety of cover technologies on the market, finding the right one can be a gamble. A local professional with knowledge of your specific location will be able to provide invaluable insight into what your best option will be. Also, keep in mind that improperly installed gutter covers may be ineffective or potentially damage your existing gutters, so you'll want someone with knowledge and experience to get the job done right. Poorly installed gutters can potentially compromise the integrity of your walls and roofs, thus possibly opening up your home to water damage. Another factor to consider is that you'll want the covers to match the look of your existing gutters.Your downspouts may also need specific adapters to maintain the integrity of the overall gutter cover system. Because of the vast amount of different gutters and gutter cover choices, a professional will be able to immediately pinpoint what it is you require and how to get your installation done in the least amount of time. Remember, you'll only get the best rates by comparing quotes from the top local contractors. Improves water quality and filtering when collecting rain water. In many cases, a gutter cover installation job can be adapted to the current gutter equipment that is already in place. A trained specialist will be able to recommend the best and most cost effective system. If any of your gutters are already damaged, you may need to replace them before gutter covers can be installed. Once you decide that gutter covers could be a great addition to the outside of your home, you'll want to get estimates from trained gutter cover installation professionals in your area. You can do this by simply entering your ZIP code into the form provided on this page. Do so now, and you'll receive no-obligation, 100% FREE estimate tailored to your specific needs from top professionals near you. Average Household Gutter - 200 Linear ft.